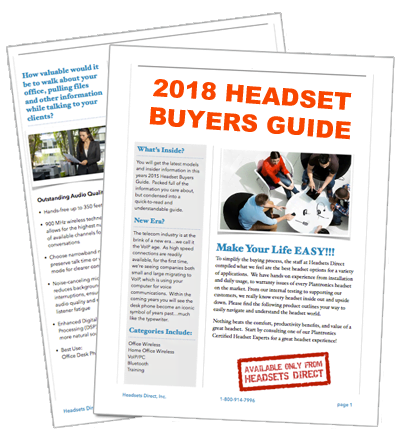 Plantronics Headsets | Plantronics Headset Parts & Accessories - Headsets Direct, Inc.
We Are An Authorized Plantronics Dealer! Our Plantronics headsets come in many styles and varieties to fit a wide range of needs and wearing styles. If you are looking for a wireless or corded headset for office or home use, a headset for your computer or cell phone, or the latest in Bluetooth technology, Headsets Direct is the best place to start your search. Headsets Direct offers Plantronics corded headsets for use in both homes and offices. Want a hands-free headset for your computer or cell phone? Our line of corded headsets includes something for everyone and every need. We also stock headsets for specialty applications such as workers in 911 Dispatch Centers, or those requiring aviation headsets. Plantronics Bluetooth headsets contain some of the newest technology on the market. Bluetooth headsets allow you to be more productive while on the go. Easy to use and versatile, there are models with various connectivity options for computers, mobile phones, iPods, MP3 players, tablets, as well as office headsets for hands-free mobility. Check out our Smart Sensor technology with our Plantronics Voyager Pro HD. We also stock a large inventory of Plantronics accessories to meet every headset user’s needs; including, ear cushions, voice tubes, batteries, and cables. If your headset is discontinued, check out our inventory of parts; you may not need to purchase a new headset, just replace a part. Headsets Direct provides a 30-day money-back guarantee and same day shipping on most orders. Experience a safe and secure checkout process, as well as receive expert advice from our knowledgeable staff. We have been around since 1996 and offer the support and experience you need for a perfect headset experience. Shop now by selecting one of our product categories above.